Most of Rovio's employees don't actually work on games. It's easy to dismiss Angry Birds as a glorified flash game, but its impact goes far beyond whatever it might be as a time waster. Even my grandma knows about it, and is probably better at it too. 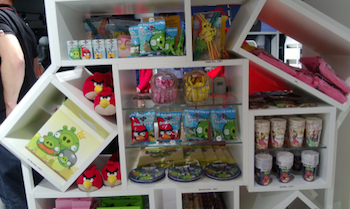 Rovio has gained exposure far, far outside of traditional gaming circles. It's even branched beyond gaming itself. So, when you pass a row of Angry Birds dishtowels at the store next time, don't be surprised. In an interview with Venture Beat, Rovio CEO Jami Laes said that most of his 800 employees don't actually make games. "I think less than half [of our employees] are working on games now," Laes said. This fits with Rovio's goal to become an entertainment company, rather than only being a game developer. "But games will always be at the core of Rovio," Laes continues. "That's our heritage... When it comes to future franchises, they'll most likely see the light of day from the games department, rather than another area of our business." In case you think that cartoon animals violently throwing themselves against each other in genocidal warfare isn't compelling or deep enough, Laes argues that its a tale for the ages. "There's an epic duopoly, an epic battle that's always ensuing between the birds and the pigs." Admittedly, most of that is developed in the Angry Birds Toons videos, which have over a billion views. It's there that Laes says that timeless questions are answered, such as: "Why is Chuck so obsessed with speed? Why is Red the most angry one of them? Why is Matilda the caring, motherly one? Why does Bomb explode sometimes when he's usually so calm?" Why indeed.